Experts opined that UVCE should be under BU at least till it gets autonomous status. 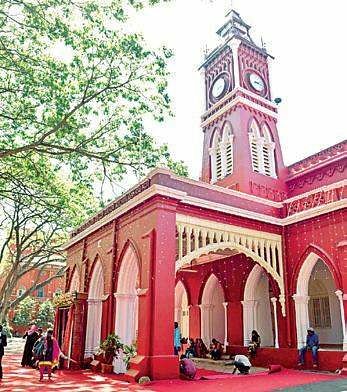 BENGALURU: All University Visvesvaraya College of Engineering (UVCE) heads of departments have come out with a unanimous resolution to retain the college under Bangalore University (BU) only till it gets an autonomous status. "UVCE is getting grants from various funding agencies considering the fact that it is a constituent college of Bangalore University, which is accredited by NAAC with 'A' grade alongwith Bangalore University. If the college is separated from BU, further grants will not be sanctioned," read a copy of the proceedings, which was signed by all the six heads of departments and three other professors who attended the meeting with the UVCE principal on Saturday.During the trifurcation of BU, a government committee headed by Prof S A Kori had said that UVCE will remain with BU. This was also mentioned in the state gazette. But later, the government had issued another order in June last year stating that as per jurisdiction, UVCE comes under Bengaluru Central University. "Two departments of engineering at Jnana Bharathi have 1,200 students and four departments of engineering in KR Circle have 2,300 students. Awarding degrees by two universities -- BU and BCU -- is not possible," said a senior BU official. Experts opined that UVCE should be under BU at least till it gets autonomous status. In the past, an amount of `25 crore was sanctioned by the government for renovation because when the government proposed shifting the two departments, students protested. "Teachers should be given an option if UVCE has to be transferred to other universities as they are appointed as BU faculty and all the departments of UVCE are statutorily created as Department of Studies of BU. Students and teachers have already chosen to be with BU and they opine that there should be one entity, and may not agree for shifting," read the resolution. UVCE has already got National Assessment and Accreditation Council (NAAC) accreditation under BU and it will be easier to obtain autonomous status. "It was unanimously resolved by the principal, chairpersons, teachers and students to retain UVCE under BU only," said the resolution signed by HN Ramesh, Principal of UVCE.